I'm Felix from Barcelona, Spain. I met Mike Oldfield in Valencia, 30/MAY/2002. Mike was presenting the new album, Tr3s Lunas, to journalists. I was there and he signed my rare swedish 13 lp box. Thanks, Mike ! 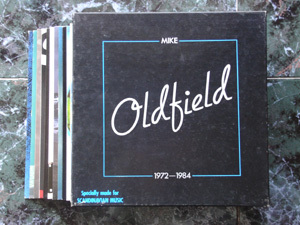 This website shows my complete Mike Oldfield collection. Mainly vinyl releases, but also some memorabilia and other rare stuff ! I'm also writing a book with photos about his vinyl releases. It includes biography and it's written in 3 languages: English, German and Spanish. Here the first chapter !